My ghost story began while living with my grandparents in Louisiana. I was twenty-three years old at the time and, it was shortly after our dad died of alcohol. A week after the funeral ,my grief srictoned grandmother had asked my grandfather if I can take my dad’s old room, he wasn’t living there before his death, so I moved in with intensions on getting a job and find my own place close to my grandparents that was the plan. About four months later I was getting ready for bed, so I laid my work things out for the next morning and closed both doors to my room, and went to bed. Just as I was about to fall off to sleep something tapped me on my shoulder. Suddenly I rush out of bed and turned on the light and there was nothing there. So I opened the door to the hall way and there was no one, both grandparent were sleeping, so I opened the door leading to the living room and there was no one there either, so I went back to bed not giving it any more thought. About one month following I went through my routine for bed laying my things out for the next day, closing both doors to my bed room and went to bed. Sometime that morning around three o’clock my eyes suddenly opened I was laying on my side facing the night stand, instantly I started wondering what was going on, and just as I turned to readjust myself in bed I felt a presence in the bed under the covers with me. Jumping out of bed only to find there was no one there. What the hell! Now that was something I couldn’t dismiss, I know for a fact that someone was there. So I started thinking and as the mind raced using the process of elimination, I could not come up with an explanation for what just happened. Ghost was the farthest thing from my mind, because I did not believe in ghost, there was no such thing. I needed something to drink; I opened the door to the living room and walked to the refrigerator for juice, and back to bed, not giving to a second thought. One month later this time, I was lying on my back when my suddenly opened again, and I found myself looking up at the ceiling, this was very unusual for me to wake up this way laying on my back and clearly aware and alert. So I slowly panned down toward my feet and the door was open, there was something that I never thought I would ever see in my life, a ghost standing in the doorway looking at me. It was a solid black mass in a perfect form of a man. I was creeped out but, never took my eyes off of it; I watched it still it backed out of view. There were four things wrong here, my eyes just popped open, I am lying on my back, the door was open, and I saw a ghost. It wasn’t a coincident, this ghost wanted to be seen. Who was it? 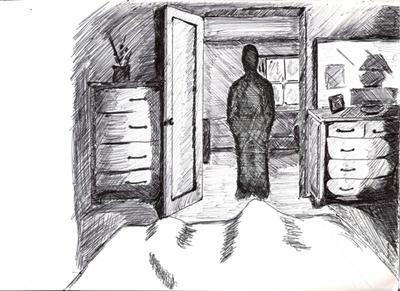 As time went on, I learned to dismiss everything that night, until it happened again in the exact same scenario, the ghost was standing in the exact same place in the doorway just as before. At this point I’m surely a believer; there are no doubts the house was haunted by ghost, but by whom? I had learned later that every family member that was there during my dad’s funeral had experienced or felt something in a ghostly manner. Decades later, and my entire close knit family members from Louisiana had passed on first my dad, then grandmother, next was my grandfather, then my aunt all passed and, throughout all of those years, I was extremely haunted, and tormented by ghost that I could not positively indentify. These ghosts had followed me from Louisiana, to North Carolina, and from North Carolina to Kuwait and back haunting and attacking me the whole time, on the daily. It was only in Kuwait when the wife and, I were sitting in bed with the voice recorder on. That’s when I decided that enough was enough and built up enough courage to turn on this brand new modified radio called a ghost box. I did not know anything about this radio or how to use it, and after by first question it didn’t take long to understand. I turn it on then asked. Is there anyone here that was murdered? That was when all hell broke loose. We found out that night that the ghosts were family. Nine ghost hiding in the cupboard and two in my belly. And the story continues. Professionally document by author. Outstanding detailing of story. Is there book on the way?